Fixed energy pricing. No forward price risks. Best rooftop solar harvest. Largest emissions reductions. More energy for your building. 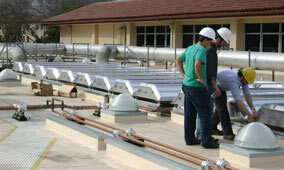 Proven solar cooling and heating systems that significantly reduce utility bills. Urban space cooling and heating loads dominate energy consumption and are the greatest contributor to ever rising energy costs. 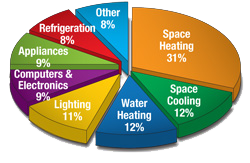 The majority of these loads are thermal and not electrical. As energy grids struggle to meet this demand, new solar thermal technologies are emerging which can offset thermal building loads directly and more efficiently. 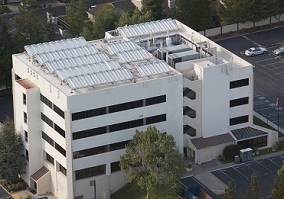 Rooftop solar resources are delivered into the building with high efficiency, unlike conventional systems which discard the majority of the sun's energy as heat. As a leader in this space, Chromasun manufactures a new range of advanced high temperature solar panels that are specially designed to easily integrate with thermal chillers and heat pumps. Chromasun then designs total energy solutions that satisfy far more of building heating and cooling loads than has been possible to date. Solar never worked so hard for you. Chromasun systems deliver the new benchmark for best environmental performance. That means greater energy savings and more useful energy from your rooftop. 15 March, 2013Chromasun wins $935,100 California Energy Commission Grant.California - Today CEC announced the winners of $12 Million in grants for the Energy Research Program PON-12-503. Chromasun was awarded $935,100 to install a custom 25 ton absorption chiller powered with 75 Micro-concentrator solar collectors to create both chilled water and approximately 28,000 gallons of domestic hot water per day at Hilton Waterfront Beach Resort Hotel, Huntington Beach, California. The project will more than double the efficiency of fuel presently burned at the hotel. 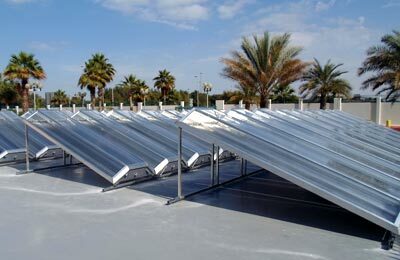 14 January, 2013 TAQA Starts Pilot for Solar Cooling Technology in Abu Dhabi.Abu Dhabi, United Arab Emirates – Abu Dhabi National Energy Company PJSC (TAQA) and Chromasun Inc. (Chromasun), the California-based solar panel manufacturer, have begun a pilot project for roof-top solar air-conditioning in Abu Dhabi. 11 September, 2012 A New Market in Microscale Solar CogenerationChromasun and Cogenra are two companies forging an entirely new path in cogenerating electricity and hot water using low concentrating PV (LCPV) for commercial rooftops. 18 April, 2012 Made in Australia: Bringing local solar technology homeThe Australian Solar Institute is sponsoring a $9.6 million project to return an Australian-developed solar thermal technology to its birthplace and establish a manufacturing base for the product, which could deliver highly efficient combination of electricity, heating and cooling to industrial and commercial rooftops. Chromasun solar-enhanced solutions reduce energy costs and protect against future energy price rises. Tell others about Chromasun and keep up to date on developments. Please join the Chromasun mailing list to be automatically notified of updates and events. ©2013 Chromasun. All rights reserved.